This is no yoke, we have the best chicken coops around. 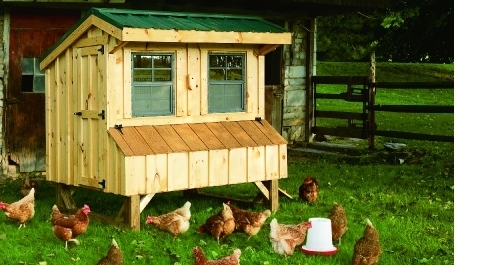 The 4′ x 6′ Quaker chicken coop is one of our best size. Comes standard with glass board floors for easy cleaning, windows, 6 off to the side nesting boxes for easy egg access, back vent with wire protection, and large side door. Made from duratemp siding, and comes painted to your chose of colors. Available in many sizes, 7′ x 12′, 5′ x 8′, 5′ x 6′, and 4′ x 4′. Wood board and batton siding is also available.